The chateau has 8 bedrooms (upstairs) and living and dinning areas downstairs. Have you dreamed of living in a castle? Chateau of Equals, situated in beautiful south central France, is a perfect opportunity to fulfil your dream. It’s perfect for family gathering where children can play with their cousins, uncles and aunts, and grandparents. The Chateau des Egaux is located on 21 hectares of private grounds, with private pool, a small lake for fishing, and a 2 hectare park and private forest.The Chateau of Equals is located on 21 hectares of private grounds, with private pool, a small lake for fishing, and a 2 hectare park and private forest. The nearest town is located 7 minutes away and provides a bakery, butchers and basic shopping facilities. There are two local restaurants within 5 minutes driving distance from the chateau. Supermarket facilities, as well as wider choice of restaurants, are located 15 minutes away. The closest city, Limoges, is a 45 minute drive. Limoges has an international airport with direct flights to London, Manchester, Southampton and Liverpool. There is a direct train connection to Paris (about 3 hours) and Toulouse (about 3 hours). The Chateau of Equals is not a hotel. It is our home. We feel fortunate to live here and feel a responsibility to maintain and improve the Chateau for future generations. The beauty of the building and the fairytale-like surroundings made our dream come true. If you also have such a dream and would like to experience life in a castle please consider a stay in our home. Your contribution will be invested back to the building to ensure its preservation and sustainability.The castle is very well preserved including original paneling, floors, and fireplaces. We have a very strong interest in sustainability, i.e. ensuring that the Chateau has a low environment impact, e.g. zero carbon footprint, and that the Chateau remains well preserved for generations to come. The Chateau is built on the foundations of the old castle, which dates back to the 12th century when the castle included 11 towers. 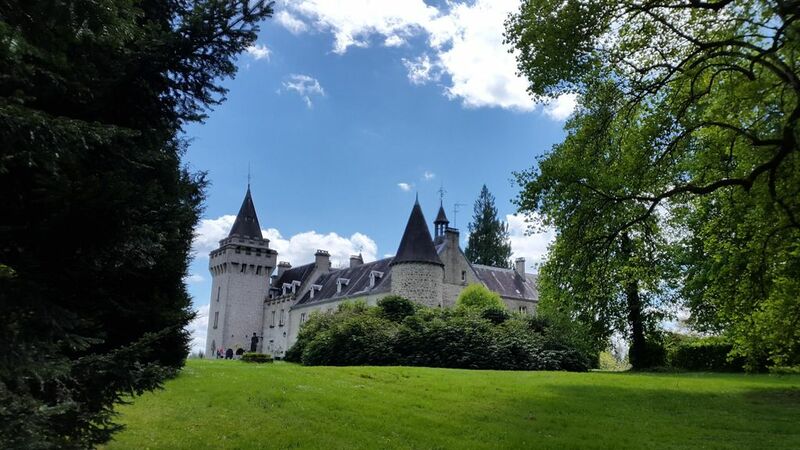 The current Chateau includes 4 tours: one of the towers from the 12th century and last tower probably dates back to the 19th century when the Chateau was modernised. Some parts such as the chapel and the grand fireplace date back to the 16th century, when two French royal families married and made the Chateau their home. Bathroom 4, 5 and 6 do not have toilets. Separat two toilets are located close to the rooms. There are 10 fireplaces in the house. However we use only one in the living room upstairs, which is modern and safe. The others we do not use. There are a bookcase with the games in the living room upstairs for use. The terrace in the north of the chateau has dinning facilities for 14. We had a truely fabulous 12 night stay in Chateau des Egaux. We were 3 families comprising of 6 adults and 8 children (from 3 to 9 years old). The Chateau and it’s grounds including the large gated pool are extremely well maintained and everything you could want. The owners were very nice people and extremely welcoming. Thoroughly enjoyable holiday...we’d all highly recommend it. Our family of four (kids age 4 and 7) had a wonderful week in Chateau des Egaux. The charming castle is beautifully located in the hilly landscape, covered by forest. It has an extremely calming and soothing atmosphere. The foggy horizon in the morning would be broken by some rays of sun and beautiful garden with a little fountain outside of the window would take you to the state of mind, where stress and rushing is unimaginable. We went for long walks in the forest, explored the area, visited the city of Limoges, went to explore village of Oradour-sur-Glane, which today is a WWII memorial to the cruelty of the Nazi occupation, drove around to enjoy the beauty of the Haute-Vienne region or just played with the kids outside in the fresh air. We foraged in the woods and found lots of edible mushrooms and chestnuts, which we cooked for dinner, went to nearby village of La Jonchere-Saint- Maurice for freshly baked bread and treated ourselves with locally produced limousine beef and lamb. In the evenings, after kids were put in bed, we were sipping local wines looking at the stars, having long conversations or just listening to the silence. It was magic. It was a perfect way for our family to spend a week together and reboot our energy. The chateaux dates back to mediaeval times and is preserved and decorated in a very tasteful and authentic manner. The hosts are very warm, helpful, friendly and caring. We will be back. The castle is incredible: authentic and almost fairy-tale like, set in wonderful surroundings. The garden and the pool are huge and very private. Our smallest and teenage children really enjoyed the vacation with small trips to charming markets in the surrounding towns and a bit of shopping in Limoges. Our stay at the Chateau des Egaux exceeded all our expectations. It was the first time we were staying in a real authentic castle. The atmosphere, the hosts, the surroundings, absolutely everything were very special and charming. But the biggest surprise for me was – my partner of 5 years unexpectedly proposed to me during a dinner by dropping a huge poster from the tower of the Chateau. I thought that he was under the spell of the Chateau des Egaux, happily, the spell still didn’t evaporate and we are getting married this year. Thanks to Chateau des Engaux! Chateau des Egaux is situated in the Monts d’Ambazac at a height of 400m. The Ambazac mountains are low mountains on the western foothills of the Massif Central ranging in height upto 700m. The area is mainly woodland with some agriculture. There are many picturesque views of the surroundings. The Chateau, parts of which date back to the 12th Century is located on 21 hectares of private grounds, with private pool, a small lake, 2 hectares of park land and 19 hectares of private forest. (iii) One of the prettiest towns of Limousin, Uzerche is known as the "Pearl of Limousin" because of its serene setting, beautiful buildings, and historic value. Many of the buildings are architectural treasures protected in a heritage zone, which was created to ensure the preservation of the city. Uzerche stands on a rocky outcrop overlooking the rushing Vézère Riv. The closest city is Limoges with restaurants museums an international airport with direct flights to London, Manchester, Southampton and Liverpool. There is a direct train connection from Paris (about 3 hours) and Toulouse (about 3 hours). The renting a car is advisable. The Chateau grounds encompass a beautiful lake where large fish can be seen basking in the sun in the later afternoon. However, the lake is unfenced and deep even at the shore line and young children that cannot swim will need to be closely supervised. Please consider this before booking. Bookings are Saturday to Saturday.